America's network of 150 National Scenic Byways lead to the heart and soul of this great country of ours — from the rugged tip of Maine to the California coast and from the colorful canyons of Utah to the Florida Keys. A National Scenic Byway is a road recognized by the United States Department of Transportation for one of six intrinsic qualities: archeological, cultural, historic, natural, recreational or scenic. The byway program was established by Congress in 1991 to preserve the country's most distinctive, but often less-traveled roads and to promote tourism and economic development. The truly unique and outstanding byways that meet two or more of those essential qualities are designated All-American Roads. There are currently 31 of them scattered across 28 states from coast to coast. "All-American Roads are simply the best of the best among the remarkable system of Scenic Byways," says Neil Gaffney, public affairs specialist with the Federal Highway Administration. "All of them are accessible by RV, plus most offer camping facilities where you can tie up your rig and stay awhile." Whatever you and your travel companions might be seeking — historical or cultural enlightenment, outdoor recreation or simply viewing spectacular landscapes — these All-American Roads will meet your expectations and more. Let's take a spin along six different All-American Roads to learn how and why these iconic motorways gained their lofty status. We'll begin with three roadways in the East and then motor out West. Acadia All-American Road loops through Acadia National Park in Maine. 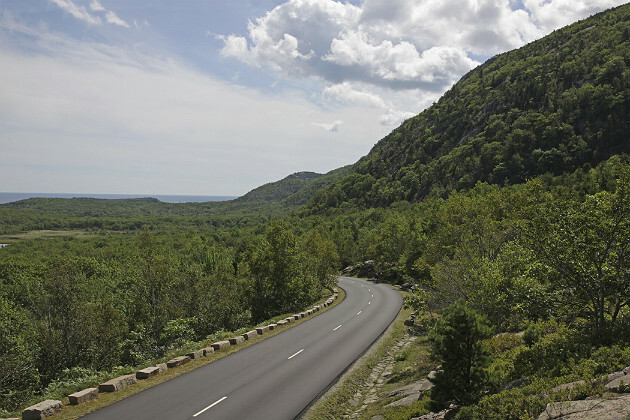 Acadia All-American Road winds south from Trenton, Maine, onto Mount Desert Island where the byway's most popular section meanders along a 27-mile loop through Acadia National Park. The loop road leads through coastal Maine's most mindboggling scenery — craggy granite peaks and outcroppings, lush old-growth forests and crashing waves. With more than 120 miles of hiking trails and a 54-mile network of carriage roads — stone-surfaced roadways closed to vehicular traffic that are a big hit with hikers and bikers — there's ample opportunity for recreation within the park. Don't miss a visit to Bar Harbor, located a few miles east of the park loop. A resort village that blossomed in the early 1900s as a summer haven for wealthy families such as the Rockefellers, Carnegies and Vanderbilts, it is home to shopping, dining and entertainment options galore. 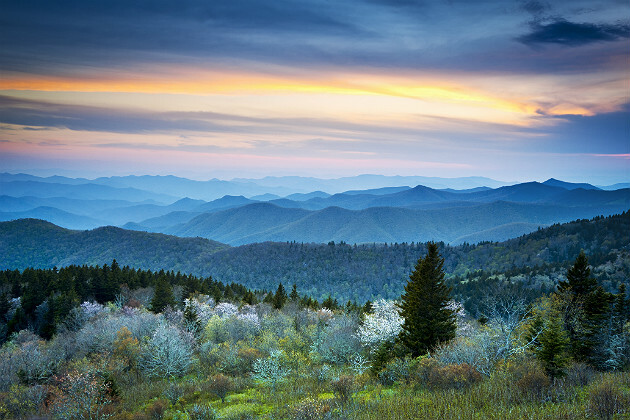 Blue Ridge Parkway offers scenic views of the Smoky Mountains. Blue Ridge Parkway rides the Blue Ridge Mountains for 469 miles, connecting Smoky Mountains National Park in North Carolina to Shenandoah National Park in Virginia and is often cited as "America’s Favorite Drive." No wonder, as the byway offers endless mountain and valley vistas, and an extraordinary variety of flora and fauna, numerous historical and cultural attractions along with plenty of opportunities for recreation. The parkway is particularly popular during late spring when rhododendron and azalea burst into full color, and in the fall when foliage reaches its peak color. Highlights along the Virginia segment include Rocky Knob Visitor Center and nearby Mabry Mill, where apple orchards, restored mills and a blacksmith shop offer glimpses of early pioneer life. At the Blue Ridge Music Center, you can tap your toes to the lively notes of old-time mountain tunes and learn much about the roots of American music. Must-see features along the more mountainous North Carolina segment include The Blowing Rock, which actually is a cliff soaring 3,000 feet above Johns River Gorge. Farther along, Linville Falls is a spectacular three-tiered waterfall that cascades into Linville Gorge, known as the "Grand Canyon of the Southern Appalachians." Wrap up your drive at the parkway's southern gateway in Cherokee with a visit to Oconaluftee Indian Village where you'll learn about Cherokee culture, through a memorable living-history experience. 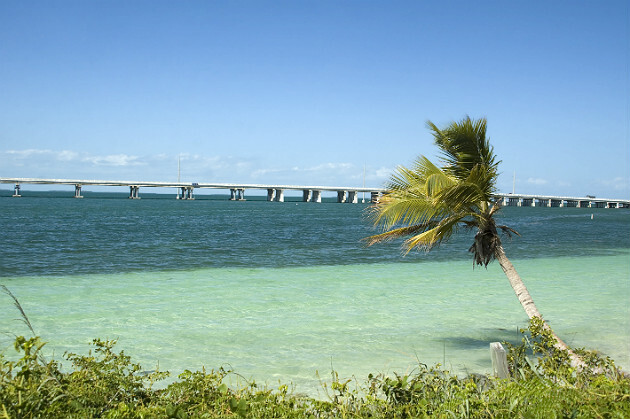 Florida Keys Scenic Highway passes the beautiful beaches of Bahia Honda State Park. Florida Keys Scenic Highway is like no other highway in America. A marvel of engineering completed in 1938, it ventures across a water wonderland of tropical turquoise, spanning 42 bridges to connect a 107-mile-long string of keys linking mainland Florida and Key West. Popularly known as the Overseas Highway and officially designated U.S. Route 1, the byway largely overlies oil-and-rail magnate Henry Flagler's ill-fated Overseas Railroad, which was destroyed by a hurricane in 1935. Features along this heavily-traveled and often slow-moving two-laner include John Pennekamp Coral Reef State Park, home to the first underwater preserve in the country and the only coral reef in the continental U.S.
Just beyond the settlement of Marathon, on tiny Pigeon Key, you'll find a notable historic site, a well-preserved work camp built by Flagler's Florida East Coast Railway in the early 1900s to house hundreds of men engaged in the rail line's construction. Nearby are the remains of one of their major projects, the old Seven Mile Bridge, which still stands beside the highway bridge and is open to the public for fishing and strolling. Bahia Honda State Park features the best beaches anywhere along the highway. It's an exceptional park where you can fish, kayak, snorkel or just stretch out on the warm white sand. Key West is the highway's terminus and its star attraction. As the nation's southernmost city, it is steeped in the colorful cultures and customs of the nearby Caribbean, and like the highway leading to it, Key West is one-of-a-kind. While best known for its funkiness, carnival-like sunset celebrations and boisterous nightlife, the city's hedonistic side finds balance in several key cultural and historic attractions — among them the John Audubon House, Ernest Hemmingway House and the Harry S. Truman Little White House. Utah's Scenic Byway 12 winds through some of the country's most diverse and ruggedly beautiful landscapes. 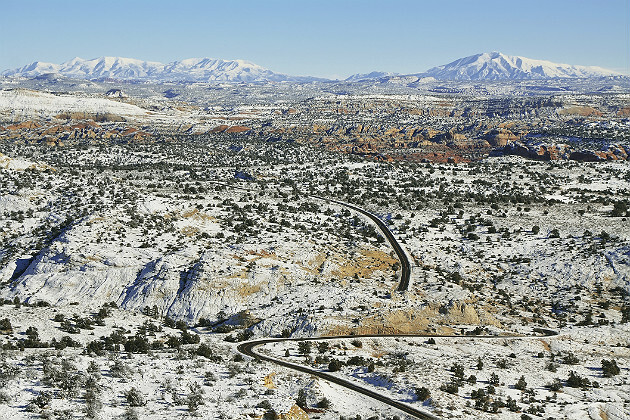 Utah's Scenic Byway 12 is hands-down the most colorful of the nation's 31 All-American Roads. Heralded by Fox News as one of the world's 10 most beautiful highways, the route rolls 124 miles through some of the most diverse and ruggedly beautiful landscapes anywhere. It winds past red rock cliffs, through slickrock canyons, pine and aspen forests, national and state parks, a national monument and several quaint rural towns. The byway begins halfway between the towns of Panguitch and Hatch where it bisects the dazzling red rock formations of Dixie National Forest's Red Canyon. Continuing east, it enters Bryce Canyon National Park and leads on to Kodachrome Basin State Park, notable for its towering sand pipe formations and a reputation as a photographer's paradise. Turning north, the byway crosses a vast expanse of slick-rock canyon country encompassing Grand Staircase-Escalante National Monument. Crisscrossed by trails, this area affords some of the most spectacular hiking opportunities in the Southwest. 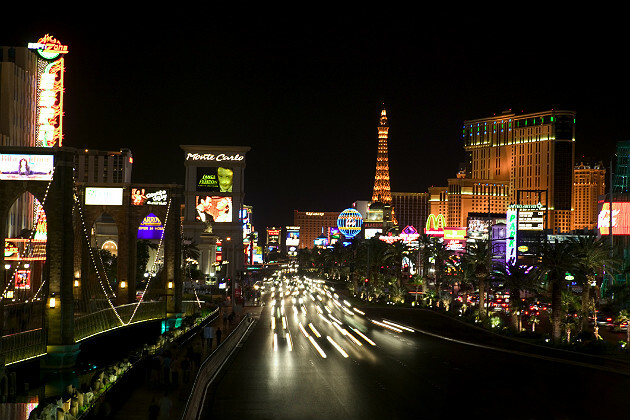 Las Vegas Strip is the only byway more scenic by night than during the day. Las Vegas Strip has predictably brought to question how this gaudy, gridlocked thoroughfare could possibly be glorified as an All-American Road. Giving thought to its cultural significance, however, credence must be paid to the excitement and sheer fantasy embodied in the brightest, boldest, most expensive and expressive five miles of roadway in America. Quite unlike the canyons typical of the Southwest, this one is lined in concrete, steel and glass and is decorated to the hilt with more than 15,000 miles of neon tubing. That, of course, makes the Strip the only byway more scenic by night than during the day. The incongruous collection of edifices along the Strip include a replica of the Statue of Liberty and another of the Eiffel Tower rising 50 stories above Paris Las Vegas Hotel & Casino, plus a volcano that erupts routinely out front of The Mirage Hotel & Casino. Insanity could well describe the Las Vegas Strip, but the fact remains — there's no highway, byway or boulevard like it anywhere in the world. 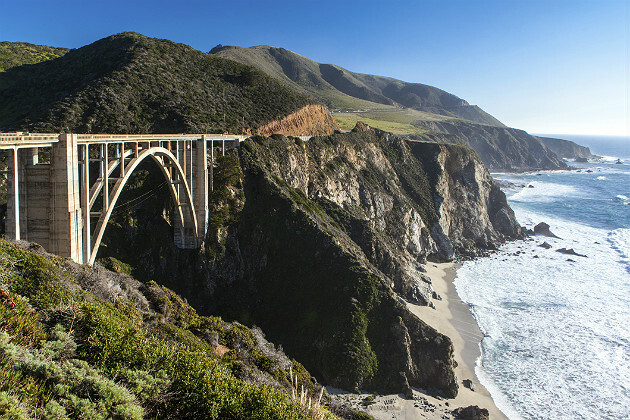 Big Sur Coast Highway is a twisting, turning, cliff-topping 72 miles of unrelenting grandeur and elemental power. Route 1: Big Sur Coast Highway is the country's quintessential coastal drive — a twisting, turning, cliff-topping 72 miles of unrelenting grandeur and elemental power. Heading north from its origins at Ragged Point Vista near San Simeon, California, the route meanders across broad grassy bluffs where cattle graze lands originally deeded by Spanish grants in the 18th century. As it enters the Ventana Wilderness, curves tighten, shoulders narrow and drop-offs become more precipitous. This is a tough and demanding drive, especially tricky for RV's, so save your gawking for the overlooks. At Julia Pfeiffer Burns State Park you can take a short hike to observe the one and only California waterfall (McWay Falls) that tumbles into the Pacific. Tucked into a redwood grove just up the road is Big Sur Coast Gallery, boasting a large collection of fine art and crafts works, many created by local artists. A mile or so farther along is the Henry Miller Memorial Library, a book store and art center dedicated to the late resident writer and artist. Pfeiffer Big Sur State Park nestles in a valley formed by the Big Sur River and serves as a trailhead for treks into Ventana Wilderness. Big Sur's best and beach is located just north of the park. Follow Sycamore Canyon Road two miles down to Pfeiffer Beach, an idyllic strand bisected by a bubbling brook and embraced by giant boulders and sea stacks. As you approach the byway terminus in Carmel, don't overlook Point Lobos State Reserve, a marvelous conservancy occupying a pristine 1,225-acre peninsula and home to a large variety of birds and animals, including seals, sea otters and sea lions. 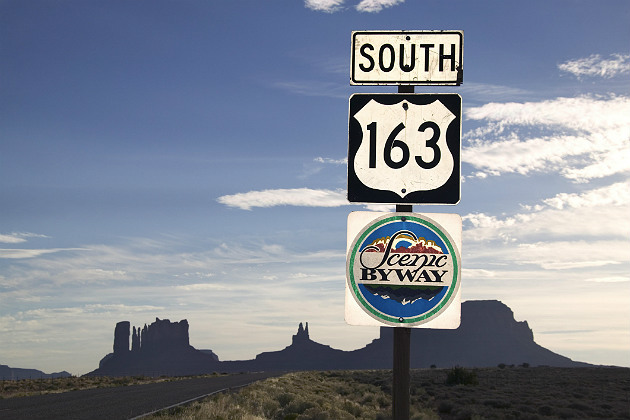 For more information on America's scenic byways, go to www.fhwa.dot.gov/byways.